The struggling teen retailer has been criticized by fans for partnering with Nash Grier for a new clothing line. Struggling teen retailer Aeropostale struck a nerve with its latest gimmick to get teens to buy its clothes: hiring a Vine star with a history of racist and anti-gay tweets and videos. Aeropostale, which has been aggressively using social media and social media stars to convince teens it's a brand for their generation, just launched a new clothing collection with popular Vine users Nash Grier, Hayes Grier, Cameron Dallas, and Carter Reynolds. The company said the garments, which cost between $13 and $20, were "hand-picked" by the four, who collectively have more than 20 million followers. While Aeropostale touted Nash Grier, who has more than 9 million followers, as the "King of Vine" in a release yesterday, numerous customers have been outraged with the retailer's decision to work with him. Grier came under fire this summer for regularly using anti-gay slurs on Twitter, as outlined by The Daily Dot, uploading then deleting a Vine saying only gay people get HIV, in which he yells "fag" to a camera, and another Vine in which he "explains" how Asians name their children. (He throws a spoon down stairs then garbles an uneducated mimicry of Chinese.) Grier, who is 16, has apologized for anti-gay comments, saying he "was young, ignorant, stupid and in a bad place," and that he has "nothing against anyone or anything that promotes equality." That wasn't enough to change everyone's opinion of Grier, however, judging by the angry comments from some shoppers. "Thanks for supporting boys who have been openly racist and homophobic," one Twitter user wrote, adding: "This is disgusting." Another asked: "How are they good ambassadors for your brand? Unless your brand is homophobic and racist?" The backlash highlights the challenges brands face in working with today's new breed of celebrity in a supremely competitive landscape. Marketers are increasingly tempted by the vast reach and youthful appeal of Instagram, Vine, and YouTube stars for ad campaigns, but unlike typical celebrity endorsers, these self-made stars have often been through little vetting or examination by the media. Aeropostale didn't return multiple calls and emails for comment on whether they considered Grier's controversial past before striking up this partnership. @Aeropostale Thanks for supporting boys who have been openly racist and homophobic. This is disgusting. @Aeropostale you guys could honestly be giving so many better people a fashion line than a homophobic jerk. Disappointed. @Aeropostale LOL at all these comments on here.. How are they good ambassadors for your brand? Unless your brand is homophobic and racist? Another reason not to shop there RT @Aeropostale: New collection designed by Nash, Cam, Hayes & Carter. 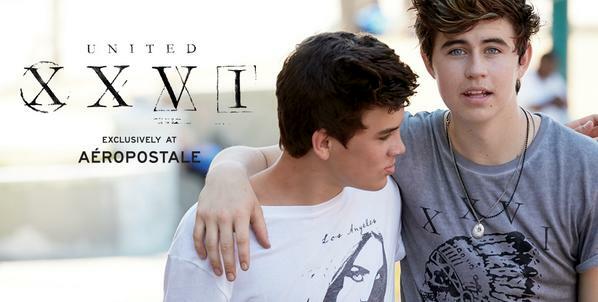 &#x201C;@Aeropostale: Saturday can&#x27;t come soon enough @nashgrier #UnitedXXVI &#x201D; are your clothes gonna be homophobic too? @Aeropostale: Saturday can't come soon enough @nashgrier #UnitedXXVI are your clothes gonna be homophobic too? hey, can everyone please boycott @Aeropostale for supporting the sexist, racist, and homophobic slime ball that is @Nashgrier? Thanks. never liked @Aeropostale HATE it even more now that they&#x27;ve teamed up with Nash Grier. If you shop there, don&#x27; talk to me. Thanks. never liked @Aeropostale HATE it even more now that they've teamed up with Nash Grier. If you shop there, don' talk to me. Thanks. Like it wasn&#x27;t already bad enough, @Aeropostale now has a sexist, racist, homophobic loser repping their brand. Like it wasn't already bad enough, @Aeropostale now has a sexist, racist, homophobic loser repping their brand. Sapna Maheshwari is a business reporter for BuzzFeed News and is based in New York. Maheshwari reports on retail and e-commerce. Contact Sapna Maheshwari at sapna.maheshwari@buzzfeed.com.